Lake County's resident expert on glass tinting services and products. You will quickly see how much you save each month in energy costs. Take care of your family by lowering harmful UV rays, cooling your home, and saving on energy costs with our high quality glass tinting film. Our window tinting film creates a uniform, aesthetically-pleasing appearance for your local business or shop. The combination of the polyester and adhesives used to construct our film makes glass safer than it ever was before. 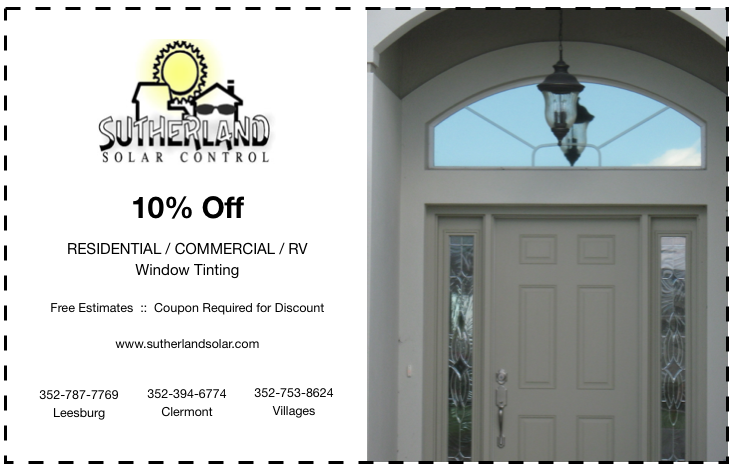 Call us today at 1-800-253-TINT for your free in-home / business glass tinting estimate! Copyright © 2019 Sutherland Solar Control | Created by Ethan A Smith Designs and powered by PureThemes.